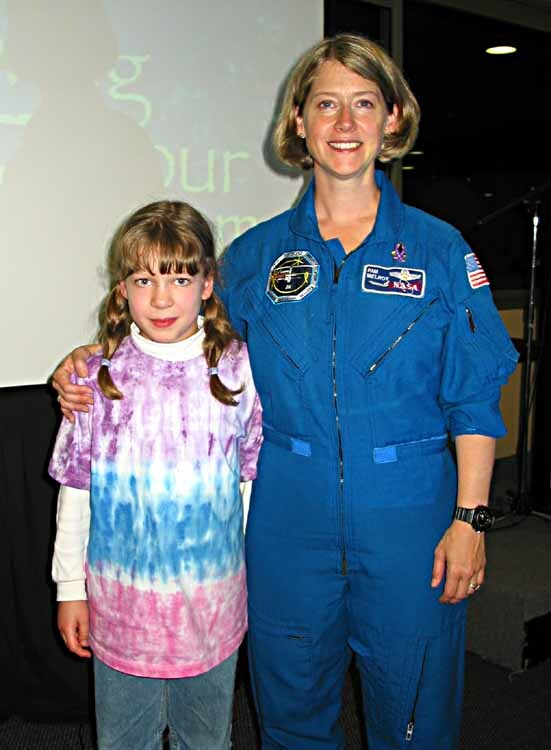 August 4-10, 2003 - Another Birthday: Sandy has continued to make modest but steady progress on her quilting projects. Over the weekend, she picked up her flannel quilt from a lady who lives in the hills south of town who has a long-arm quilting machine. Now Sandy just has to put the binding on and it is finished--Clara and Lucy are quite excited as this is the first quilt that Sandy has made for them. She also finished (except for the binding) the daisy wall hanging quilt that she started just last weekend at a local workshop. Plus, she has finished all the quilted Christmas ornaments that she had cut out - so pretty soon, she will be able to dive back into her Japanese "Bento Box" quilt (started in Thursday quilt group last term) and her Great Barrier Reef quilt (started at this year's quilt camp). The week went fast, especially now that we need to somehow fit three instruments (piano, violin and clarinet) into the practice schedule. Part of the regular music curriculum at Wilderness includes introducing all girls to a stringed instrument in Year 2, the recorder in Year 3, and a band instrument in Year 4. So the girls in Clara's class were all proudly carrying home their instruments on Tuesday afternoon. After deep and mysterious analysis by the music department, the clarinet was deemed to be the most suitable instrument for Clara (it was also HER first choice - second was trombone)! So far she has been happily blowing away on her new clarinet every evening at home this week. In the classroom, the new major project for Clara this term is to pick a natural environment on Earth, and report on its characteristics - climate, ecology, weather, history, etc., and to present her information in a shoe box. Clara chose to research arctic environments (she's leaning towards Antarctica at present) and has started gathering info beginning with a trip to the local library on Saturday morning. Our old computer has been showing it's age, and Tim has wanted to get into more video editing, rather than just the still photography editing he has been doing, so we bought a new computer. This one will be dedicated for Tim and Sandy, and, once we finish rearranging the house and furniture and desks, the old computer will be cleaned up and dedicated to Clara and Lucy for their projects. They are quite excited, as they get tired of waiting in line to use the one computer we have now! Tim is quite pleased with the new computer so far, as he was quickly able to load some of our recent video from Clara's birthday party and manipulate it - so perhaps we'll have to add an "Oz Movies" page to this website before long! Saturday was the day Lucy has been for waiting for - her first real birthday party Down Under. 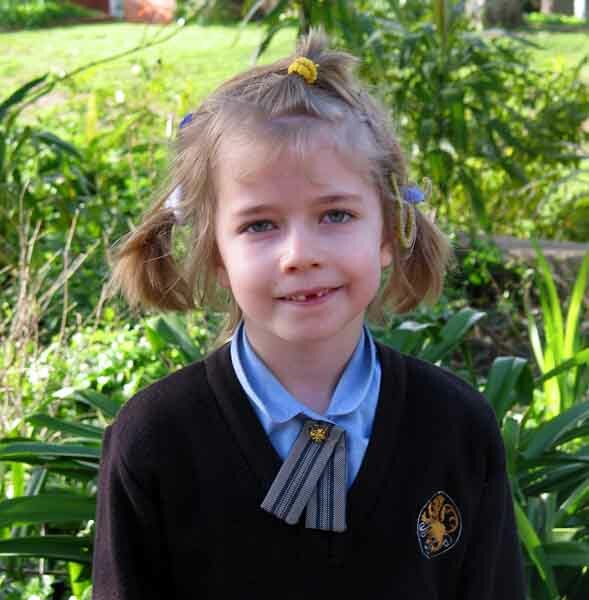 She invited her Year 1 class to the Adelaide Aquatic Center for a pool party, and 17 other girls were able to make it - for a total, including Lucy, Clara and Clara's friend, Allanah - of 20. The girls had a great time spending about an hour and a quarter in the water playing games organized by the aquatic center instructors, riding on a giant whale, and so on. After that, they devoured platters of fruit, cheese, smoked salmon, ham, crackers, M&Ms, and chocolate cupcakes decorated with lttle tropical fish. Even with all the preparation Sandy had done over the preceding weeks, it was a very action-packed several hours, so Tim and Sandy were rather limp by the time we all walked out to the car. Allanah's and Jessica's dad, Chris, stayed to help, and we truly appreciated the extra pair of hands and moral support! August 11-29, 2003 - Back to America Again: Tim had to go back to the States yet again - hopefully he is now back for the rest of the year! Friday, Sandy went off on a tour of the Central Market with Susan. They had a great time, and Sandy came home with lots of things to try. Over the course of the week she made several dishes with new ingredients she had found (such as a New Zealand Polish sausage), and the girls have loved all of them. Saturday morning, Clara got a phone call from her friend Kimba, and they wanted Clara to join them on a trip to the hills to visit a farm owned by one of Jasper's classmates. Apparently they were going up for a bbq and were letting Kimba bring a friend. So they picked up Clara at about 12:45 and brought her home at about 8:30 in the evening. Lucy and Sandy had a quiet afternoon and evening together - Lucy wrote a lot of her birthday thank you notes, and then they spent some time playing games - Lucy beat Sandy at Memory (but not by much this time) and at Yahtzee. Sunday, Clara had a friend, Shana, over for the day. They had a good time and baked Great-grandma Appl's apple cake recipe (Clara reports that it was very yummy!) Monday, Sandy went to Clara's class to help out, then just the normal evening routine, homework before supper then violin and piano practice afterwards. Clara and Lucy also worked on gathering up stuff for their book week costumes for Thursday (Wilderness is having a "Book Character Parade" where the girls get to dress up as their favorite book character). Lucy is going to be Annie from the Magic Tree House books, and Clara is Jody from the Dolphin Diaries. At one point, the long curly hair with red ribbons for Lucy was just not working, but Clara happened to come out to the kitchen and she had a different idea to make it work better, and when Lucy looked in the mirror, it met with her approval, so Sandy breathed a sigh of relief. Clara has also been teaching Lucy how to sew, as well as making things on her own - this past week she made an apron for one of her dolls, and is now working on a pillow. At school, Clara has been working on a solar-powered boat. She's building it with friends Allanah and KB; they've named their boat The Red Dragon. In art, they spent some time making rubbings of different textures in the playground. In PE, they've been learning to play Minkey, a variation of hockey for kids which is played across a normal field (i.e., two Minkey fields will fit into one hockey field), and with six kids per side. Sandy spent an afternoon in Lucy's class as well, helping out with their project to make fish from plastic soft drink bottles. All the girls seemed quite tickled with their thank you notes that Lucy did (thank-you notes are, sadly, not a common thing among the school girls). Later in the week, Lucy received a letter from Tasmania, and Tim & Sandy were scratching their heads as to who in Tasmania would be writing to Lucy! It turned out to be one of her classmates, who is on holiday in Tassy, and wrote to thank Lucy for her thank-you note! As Sandy says, maybe we'll start a trend in her class. The girls had another good week in school, keeping busy with the usual activities. Our landlords also started moving into the other half of our house this week. Tim made it home safely on Sunday, and was very happy to be back. He brought the usual odds and ends of American-made items back that Sandy and the girls miss (such as Crest toothpaste, Flintstones vitamins, Reeses peanut butter cups, and Jolly Rancher Lollypops). He also brought four cans of Marie Callender cornbread mix for Sandy; even though she has experimented and developed a reasonably good corn bread recipe using mostly Australian ingredients (only the baking powder still comes from the US), she insists that it is still not as good as Marie Callender. This week also saw a developing fascination with the game Five Crowns, which Clara got for her birthday. She, Lucy and Sandy have played it quite a bit, and Tim has joined in a couple times as well. As Lucy is very fond of repeating, the motto of the game is "The game isn't over til the Kings go wild!" It is made by the same folks who produced Quiddler, a word game which is also a favorite of ours, and Set, a matching game which is available in cards or on the computer. A free version of Set is available for download here, along with additional educational material. September 1-15, 2003 - Two Years - Already? This week we realized that it was two years ago we left Seattle for Adelaide. It certainly doesn't seem like it, although we occasionally feel pangs of time passing, and the need to step up our rate of exploration of this continent, and dive into all the regions we have so far only read about. The week passed in a blur, with both cars going into the shop for service and both girls with the usual full school calendar. In fact, on Thursday, Clara went into the recording studio with the rest of the Wilderness Junior School String Orchestra to cut a CD! We can't wait to hear what it sounds like. Then, on Friday, Tim surprised Clara and Lucy by picking them up at school and meeting Sandy at Silver Keys downtown to get Clara a violin of her own (instead of the school rental she's had for nearly two years.) Clara was quite excited. We went into the store and selected a couple of violins with the help of Ian, the extremely helpful string expert (he does all the setup and repair of the violins for them, and knows Clara's teacher - and her likes and dislikes - very well.) At this point, we weren't certain whether Clara really wanted to do this or not, as each note she played on either violin seemed to bring a grimace instead of a smile. It took her a while to warm to violins that sounded different and felt different, a different bow, etc. However, she got into the swing of things, and eventually settled on a violin, then picked out a bow that she preferred, and by the time we left the store, she was bubbling over, and couldn't wait to get home and play her new violin again. In fact, she spent much of Friday evening just holding or playing her violin, and saying how much she liked it. Saturday came with another double birthday party - one for Lucy in the early afternoon (a "Hula Dancing Party"), followed by a sleepover for Clara at Nicole's house (along with Allanah, Kimba, and Zoya.) Sunday morning, Sandy picked up a very tired Clara, who immediately fell asleep in the car. She also was pretty stuffy, perhaps from the cat (or dog) - but she perked up after her nap. Then, out of the blue on Monday we got an urgent call from our property manager regarding our lease renewal. We knew that our landlords are trying to sell their other house, and had moved (partially) into the other half of our "pseudo-duplex." Unfortunately, the other half only has three bedrooms, and they have three older (late teens) kids as well as themselves, so it is just not big enough. Thus, the property manager informed us they are going to need our side for the kids before long, and might not be able to commit to a long term renewal. On Tuesday, our landlord came to visit Sandy in person and we learned that we definitely have to move--within the next two months! So we've been checking the rental ads, and Sandy has started the rounds of houses again. 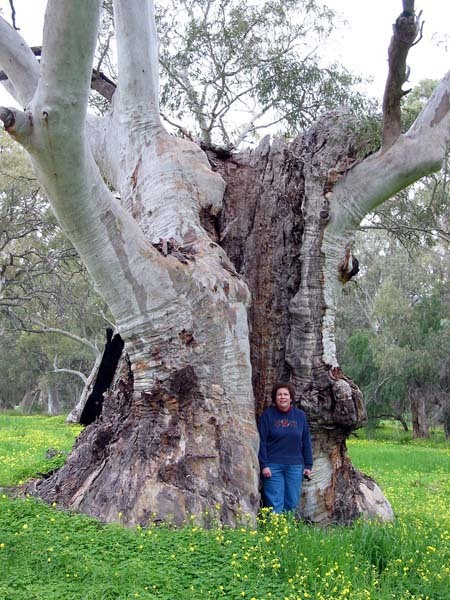 But - on the bright side this week - we took four days to go to the Flinders Ranges north of Adelaide. The Flinders, like Kangaroo Island, was one of those relatively nearby areas that we intentionally did not visit in our first two years, so that we could fit them in for a quick getaway when time for longer vacations is not available (like right now, when, in addition to our house-hunting, Tim is concentrating on three major reviews at work which are scheduled for the next two months.) So, we've set up another set of web pages specifically for this latest trip (journal here and pictures here) - but, given the demands of finding a new place to live, it will take us even longer to get the trip pages complete! On Monday Sandy took a workshop that she has been looking forward to for months from The Thimble Lady and learned much about improving her hand quilting technique and was making much finer stitches after just a short time. September 16-21, 2003 - More from the Flinders More text and pictures have been added to the Flinders journal and pictures pages. We've jumped into the house search, and Sandy has already been to see a number of houses. We've have a number of friends saying that they should buy a house just so they could rent it to us - and the ladies in Sandy's quilting group have already turned up one lead that hadn't shown up in any of the other channels yet! One thing we forgot in the last update - Father's Day was celebrated in Australia on Sunday September 7, so Tim was the recipient of a number of hand-made gifts and cards from the girls - two of them in French, so he had to request a translation! Thursday was Assembly at Wilderness, and this week it was the turn of the Year 1 class to present an "item." This week's item was for each girl to present a pair of objects connected in some way - one of the objects had to be an animal they had seen at the zoo on their field trip (or excursion as the Aussies say) the previous week. The other object could be anything - the only other constraint was that there had to be some connection with water, since the theme for the term in the Junior School is "Make A Splash." This is part of an Australia-wide effort to impress the kids with the water shortages that Australia is always facing, and the importance of conserving water. At dinner that night, Tim asked Lucy to tell him some of the pairings, to see if he could guess the connection. Unfortunately, he failed to get any right (or even to get warm in his guesses according to Lucy!) One example was a penguin and an umbrella - which are similar (in the mind of a Year 1) because they can both float; Lucy's was a flamingo and a fishing rod - because they both catch fish. Tim might have gotten this one eventually, but Clara blurted out the answer before he had a chance! Friday was "Bad Hair Day" (or "Casual Hair Day" if you prefer) at Wilderness. 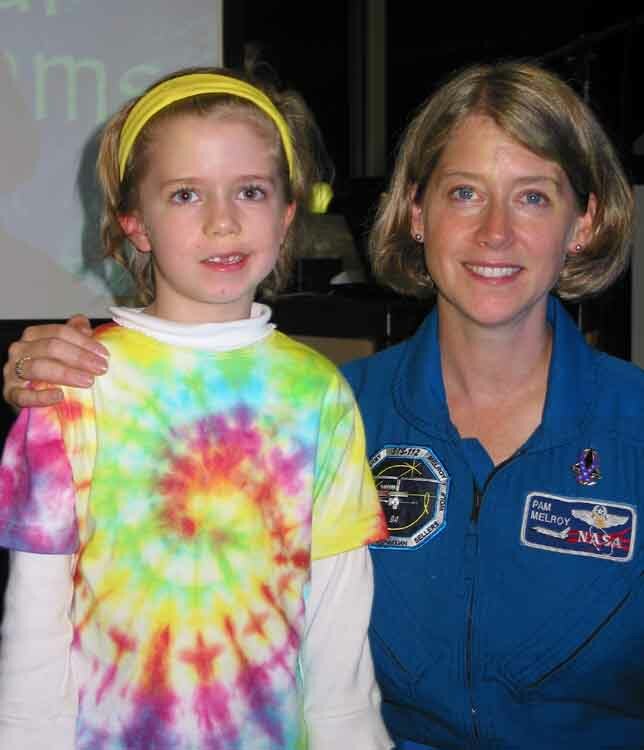 Usually, the girls are required to keep their hair (if long enough to touch their collar) in pony tails or pig tails, and they have to use either brown or black bands, or a "Wilderness Blue" ribbon (or band for PE). Clara wasn't really feeling in the mood to really go casual (she's still recovering from her respiratory problems.) However, Lucy DID go all out. 10 multi-colored bands producing 10 mini pigtails sticking out at all angles, and, at Tim's suggestion, a small plastic snake tucked in behind an ear with the head hanging down. When Tim was driving home on Friday, he saw an interesting sight - bicyclist being harassed by a magpie. The biker had a red hemlmet with what looked like a bright yellow pattern on it, which apparently intrigued or bothered the magpie. The bird would swoop down, barely missing the biker's helmet, then loop up and over, and come back again. Tim saw this behavior repeated 5 times before he had driven out of sight - wonder if the magpie followed the biker all the way to his destination? There is only one more week in the school term, which means that a number of special events (concerts, plays and the like) are coming up. 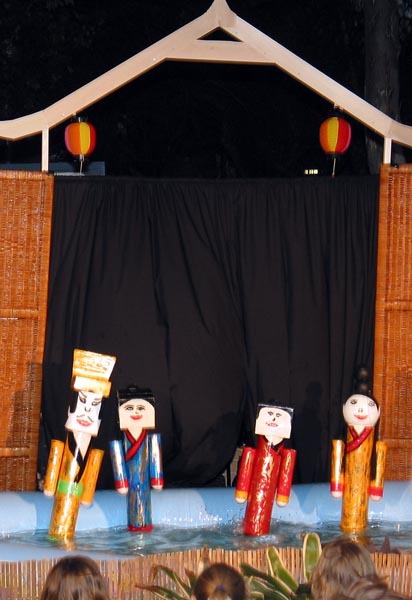 Tuesday is Clara's Vietnamese water puppet play - three shows in one day. Thursday night the junior string orchestra plays in a concert held at Elder Hall on the campus of the University of Adelaide. 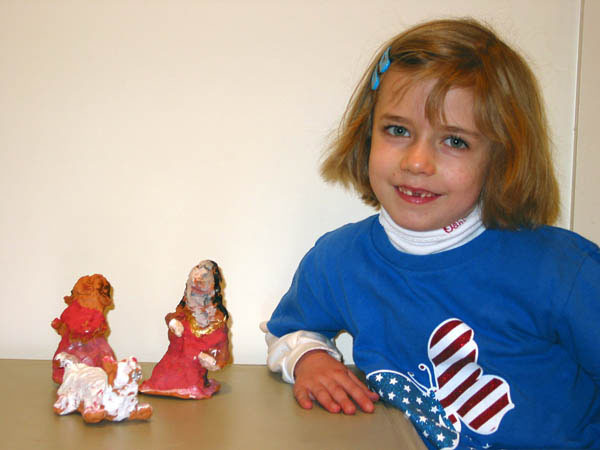 In addition, Clara's term-long project is due next week. This term, the girls had to choose a unique region / ecosystem, and research it, then present all their information in or on a shoe box. Clara chose Antarctica, and has been devouring books on the continent, including descriptions of the various Polar expeditions, such as the Scott and Amundsen expedition. Not surprisingly, given the British heritage of Australia (still far more in evidence than in the US), and the "glorious failures" of many early Australian explorations, the Australian-written books tend to come down in favor of Scott, the "glorious amateur" vs. Amundsen, the "professional" who actually believed in planning ahead, adapting, and learning from mistakes. So, Tim has been trying to ensure that Clara gets a balanced (from his perspective) view of the two expeditions. He highly recommends Roland Huntsford's books about Scott and Amundsen and Shackleton as an even-handed description of the state of Polar exploration in the early 20th century. Lucy, in Year 1, generally doesn't have much homework, so she is able to concentrate more on piano playing and reading for pleasure while Clara is doing homework. Here's a "Work In Progress" picture - note the small model of Amundsen-Scott South Pole Station. 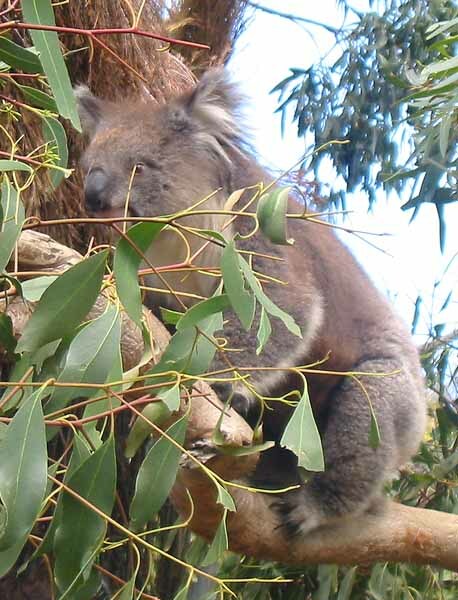 We've added an additional page to our Australian pages; this is an annotated guide to the various references (e.g., books, maps, etc.) that we've found useful on our journeys, and planning our trips. We thought it might be useful to others planning to visit the various regions. It is only in embryonic state at present, and will start with references from our Flinders trip; we hope to expand it as time goes on. 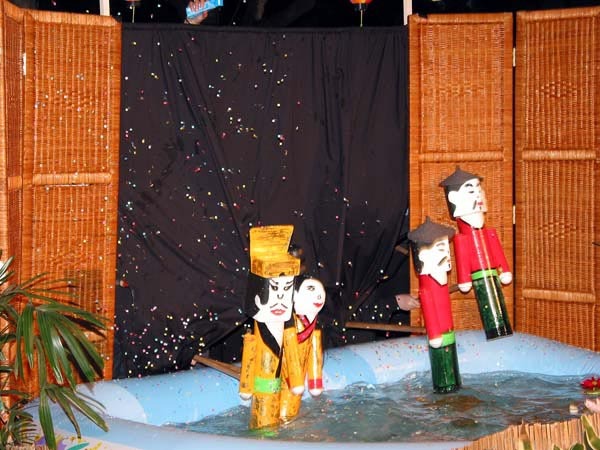 September 22-27, 2003 - Vietnamese Water Puppet Play: This was the last week of the term - which means a madhouse of last-minute activities and the culmination of various projects. 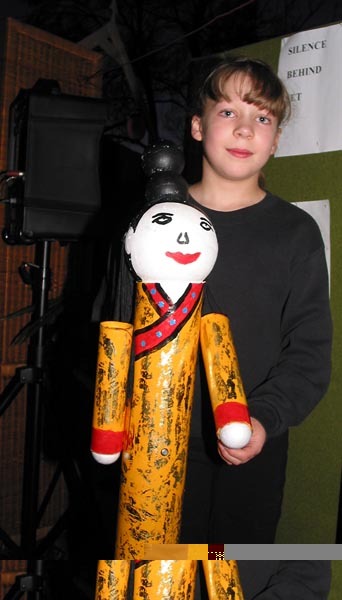 For Clara, the big things were finishing her Antarctica in a Shoebox project, putting on three editions of the Vietnamese Water Puppet Play the Year 4 girls have been working on since last term, and the Junior and Middle School concert put on by the string orchestra. The Year 1 girls really don't get into big projects as such - but next year, we expect Lucy will have plenty of activities to keep us running constantly. Lucy's main project of the week was finishing her portfolio - this is a large drawing book full of pasted-in pictures, projects and homework the Year 1 girls have been working on for the term. The girls get to take it home during the last week to show their parents what they've been up to. 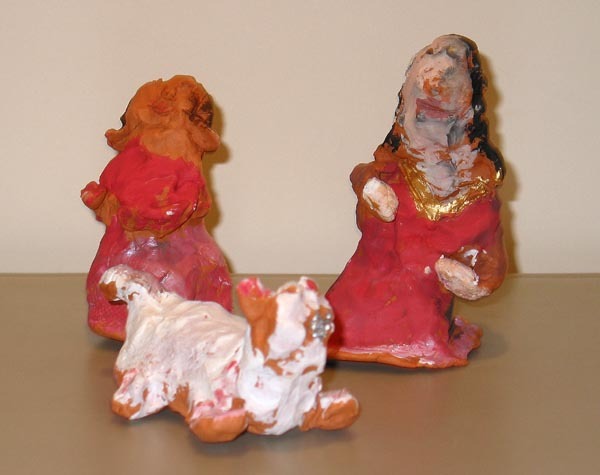 Lucy also brought home three clay figurines she made in art during the term (see also here). Tuesday night was Tam and Cam night - the Vietnamese Water Pupper Play. This all started with a Vietnamese story that the girl's teacher, Ms. Burgess, read to the girls last term. It was essentially a Vietnamese version of Cinderella. From there, the girls have been working on developing the play - brainstorming ideas about scenes, characters, dialog - and then writing a script. 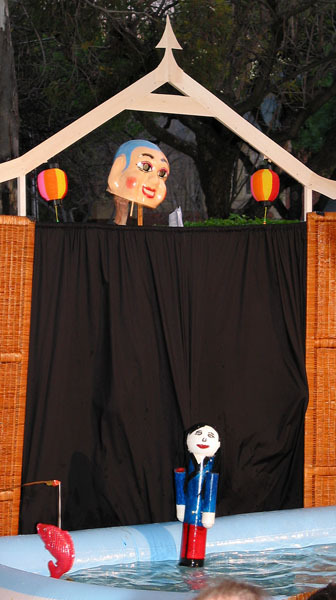 They also had to build the puppets and a set (with help from Ben, the Wilderness handyman). They selected music, had a contest to design and write the program, and even came up with a series of bloopers to entertain the parents as a surprise as a grand finale. The music was provided by Vietnamese instruments (although one of the gongs was actually a traditional Chinese gong). Since they play is supposed to be performed outside, we were all watching the weather forecasts quite closely. Clara was somewhat worried, as there has been a fair bit of rain off and on, and the weather forecast wasn't looking great. Monday, the girls began setting up the set (outdoors, in a small garden area behind the Year 1 classroom). They all went home hoping for no rain overnight or on Tuesday! Fortunately, Tuesday dawned sunny if windy. Clara went happily off to school in her puppeteer's outfit (essentially her halloween black cat costume without the fur trim or ears) - she was quite pleased as this weeks has three casual dress days in it - Tuesday for the play; Wednesday for the cast party and excusion to a local reserve, and Friday for the last day of school. 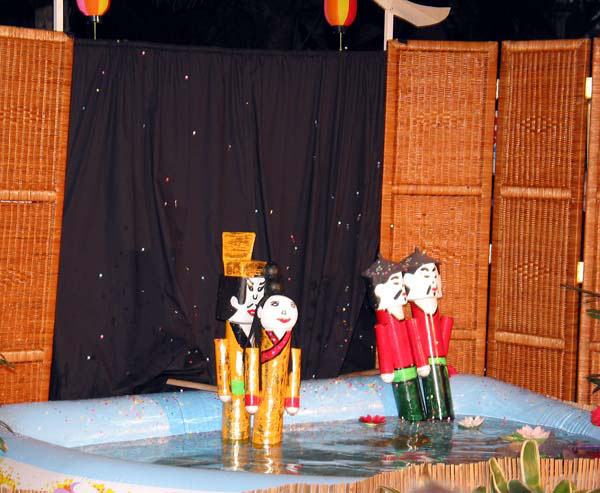 This IS a water puppet play; you'll notice the pool full of water that acts as the stage; the puppets are made of styrofoam, and the puppeteers made good use of the water, splashing to great effect; a magic fish (and a Buddha) were also central to the plot. Unfortunately, the day really took it out of Clara. She was a little lethargic in the morning, but insisted on going to school, since the Year 6 girls were taking the Year 3 and 4 girls on a hike to Scales Park, a local reserve. The Year 6 girls do this as part of getting their Earthkeeper Keys, and help pass on some of the ecological awareness they learned to the younger girls. It was quite a hike, and when Clara got back, she was so sick she even told Ms. Burgess she wanted to go home - something that had never happened before! So Sandy got a call from the school nurse and came and retrieved Clara, who was sleeping on the classroom floor while the cast pizza party was in full swing around her! She perked up a little after a shower, some food, and some medicine, but had a rough night. On Thursday, Tim took Lucy to school, and Sandy took Clara to the doctor, who provided an antibiotic and a stronger pain killer. So, Clara missed her debut concert with the string orchestra - guess we'll have to wait for the CD they recorded a few weeks ago to hear her in action! When Sandy and Clara picked up Lucy at school, several girls ran up to tell Sandy and Clara all the news. It seems that Clara had won an award in assembly this morning. We're not quite sure what it is yet, but apparently it was related to achievement in English, and she's in the top 10 percent in Australia. 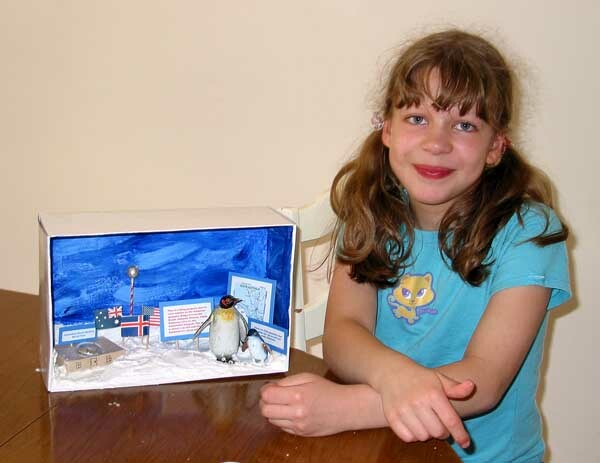 They also told her how much they enjoyed looking at her Antarctica box. And, her solar-powered boat, which she was building with Allanah and KB has been chosen as one of the school's representatives in the upcoming competition in a few weeks. The boat was originally called The Red Dragon - but as Clara says, The Red Dragon doesn't suit it any more. It is now known as Speedy. Clara had a better night Thursday, but she was still in no shape for school. So she stayed home with Sandy, and Lucy went off to school. At the end of the day, everyone was quite glad that the holidays were here for a couple weeks - it's a lot easier to fit in all the required piano, violin and clarinet practice when you don't also have a full day of school and homework. So, Sandy promptly decided to celebrate by coming down with Clara's illness. Sandy was coughing a bit Friday night, and had a full case by Saturday. So, Tim and Lucy pretty much had the house to themselves - Sandy and Clara got up, had a little breakfast, and went back to bed in Tim & Sandy's bed! Saturday was also Grand Final day (for Australian Rules Football - aka Footy). This year, while both Adelaide teams did well and had serious chances of making it to the finals, they both were eliminated in the run up. The final was between the Brisbane Lions and the Collingwood (Victoria) Magpies. Once again, the Lions took it - in fact, they've won all three Grand Finals since we've been living in Australia. This Grand Final lasted 126 minutes - and many of the players played for nearly all that time - their level of fitness and athletic ability is incredible. We've also added more text and pictures to the Flinders pages, and there are a couple new pictures on the regular Oz pictures page. 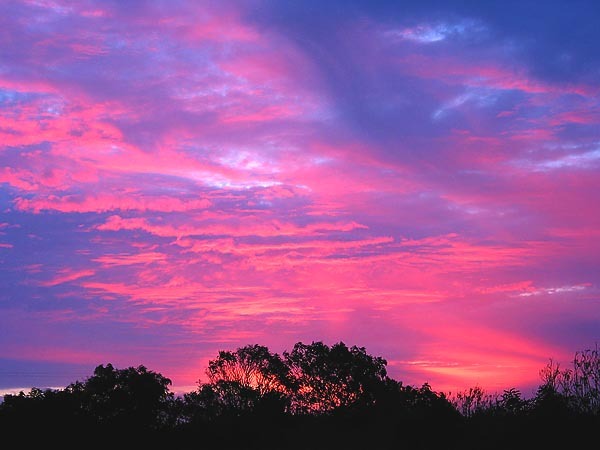 More information about Adelaide: Click here to check the Adelaide weather (and forecast). For more accurate local observations from the Australian Bureau of Meteorology, updated every 10 minutes, check here. Get the current time in Adelaide here. Find a street address in Adelaide via WhereIs Online. Last web page update was December 2, 2003. Copyright © 1992, 2000-2004 by Timothy A. Tibbetts - Copyright and contact details.